And it kinda sucked. But only kinda. When I went in for my physical exam, my primary care doc had me drink a glass of water while she pressed her fingers against my throat. Looking for exactly what she found. Thyroid nodules. Except we didn’t know that’s what she found. Just that it felt off to her. So she sent me to get a sonogram of my throat, and that’s when we found the nodules. Two large ones (one on each side) and something like a dozen small ones (only on one side). One nodule, the largest one, showed some peripheral vascularity; it had blood flowing to it. From what I’ve read internal vascularity, within the nodule, is much more of a concern. I went to an endocrinologist to get the nodules biopsied. She showed me the sonograms, which I greatly appreciated, applied topical anesthetic to my neck, and then waited until the anesthetic took effect. Then they wiped down my neck with betadyne and proceeded to insert needles into my thyroid. They wanted three samples per large nodule. The actual moment when the needle breaks skin isn’t bad. You feel it, but not much. 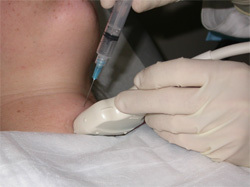 It’s once the needle is in the thyroid and they have to wiggle it around a bit to cut out a sample. That part hurt. It wasn’t horrible. It was unpleasant. They took seven samples from me; the endocrinologist wasn’t happy with one of the samples so did an extra one. I am all for that. I’d rather have too many samples than too few. Afterwards, they stuck two little round bandaids on my neck, which immediately made me think “vampire bite”. My boyfriend had the same reaction when he saw them. They also gave me an ice pack. It’s after that it hurts. Yesterday evening and today, it’s unpleasant. Reminds me of when I had the tonsillitis of doom. Which is not something I ever like to be reminded of. So that’s been unpleasant. I think the main issue is just that your neck is constantly moving as you talk, look around, eat… do anything, really. So you feel it constantly. The same procedure elsewhere wouldn’t be as unpleasant. But, it’s done now. I should be getting the pathology results this week.